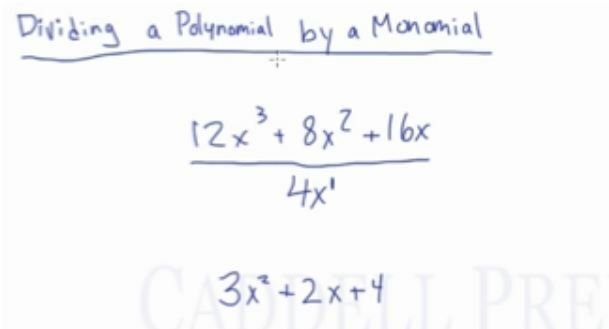 In this video, learn how to divide a polynomial by a monomial. In this video, we are going to look at how to divide a polynomial by a monomial. we will divide each term in the numerator separately by the denominator of 4x. In this short video, we’re going to review dividing a polynomial by a monomial. We have a polynomial divided by . The very important point n dividing a polynomial by a monomial is you should divide each term of the numerator by the denominator. To recap, in dividing a polynomial by a monomial, we have to divide each term on the numerator by the denominator. Each term must be able to be divided by the denominator in order to do so.